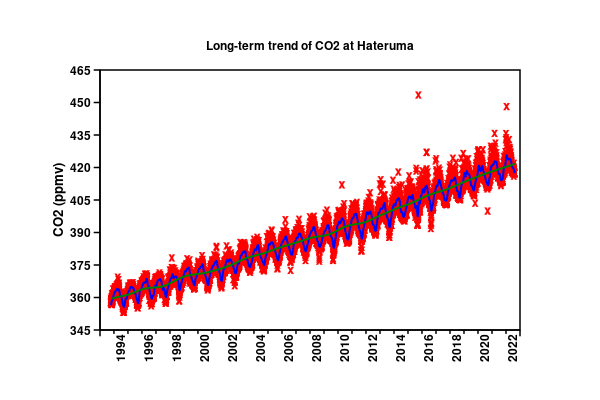 This page presents the most up-to-date CO2 trend and increase rate observed at Hateruma Island, a small sub-tropical island located at the southern end of Japan. The station was established in 1992 to monitor the long-term trend of greenhouse gases in the Eastern Asia. The values here are preliminary, Please note that there may be changed by the detailed examination in the future. The annual increase is calculated by the difference of daily mean CO2 concentrations in the past 365 days and the concentrations in the same period of the previous year. To avoid effect of missing data, the daily mean concentrations are obtained by Thoning's exponential frequency filter [Thoning et al., 1989, J. Geophys. Res., 94(6):8549-8565]. Long term trend of daily mean CO2 concentrations. Daily mean CO2 concentrations in the past 365 days comparing with the previous year's level. Hourly CO2 concentrations in the past 365 days. Hourly CO2 concentrations in the past 30 days. Hourly CO2 concentrations in the past 7 days. If you click here, you can link to the page of "database", to see the detailed data of Hateruma station.